This document is a guide to the North Dakota Grazing Monitoring Stick. A Grazing Monitoring Stick can be a fast, user-friendly tool for measuring and monitoring utilization of pasture and rangeland. Utilization measures the percent of the plant that has been removed by grazing animals. Monitoring utilization of grass can determine livestock removal date and prevent overgrazing. Pastureland is grazing lands planted with introduced or domesticated native forage species. 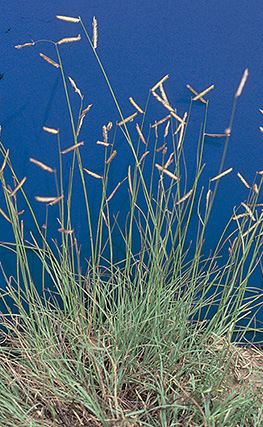 Common grass species planted for pastureland in North Dakota include intermediate wheatgrass, crested wheatgrass and smooth bromegrass. Rangeland is areas of native vegetation dominated by grasses that are managed through manipulation of livestock grazing and/or prescribed fire. Types of rangeland include grassland, shrubland, woodland and savanna. Utilization is a measure of the percent of the plant that has been removed and/or destroyed by grazing animals. Monitoring the utilization of grass can be used to determine the livestock removal date and prevent overgrazing of range and pasture resources. The GMS is a modified yardstick with information related to grazing management and utilization to aid in monitoring grazing resources. This publication is a guide to the North Dakota Grazing Monitoring Stick. Guidelines are based on plant communities of the northern Great Plains. The protocol presented in the following sections must be implemented to insure that the GMS is providing you with the correct information for your pasture or range. The video below demonstrates how to use the North Dakota Grazing Monitoring Stick to measure range and pasture utilization. To assess utilization accurately, taking multiple measurements across the pasture is critical to account for variability in utilization and ecological sites. You should take a minimum of 30 measurements for each key species across a pasture to account for variability, based on recommendations from the Natural Resources Conservation Service. 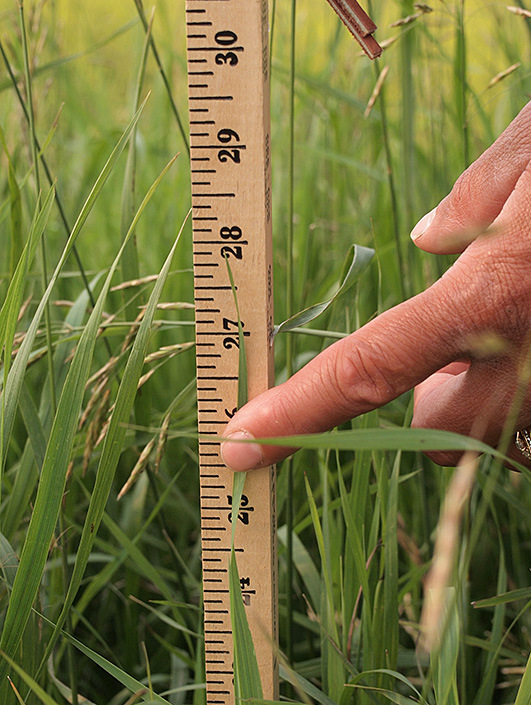 If you have a large grazing unit or one that has numerous ecological sites, you should take additional measurements. When selecting sites, avoid heavy-use areas such as watering facilities, salts and minerals, and gates. Monitor utilization throughout the grazing period to ensure that you achieve proper utilization and prevent overuse of key species. As a general rule of thumb, proper utilization is achieved when 50 percent of the total plant weight (not height) of key species has been removed (Figures 1, 2 and 3). Final utilization levels should be evaluated within three days of livestock removal. Figure 1. Percent of weight of western wheatgrass utilized at different stubble heights1. Figure 2. Percent of weight of needle-and-thread utilized at different stubble heights1. Figure 3. Percent of weight of green needlegrass utilized at different stubble heights1. 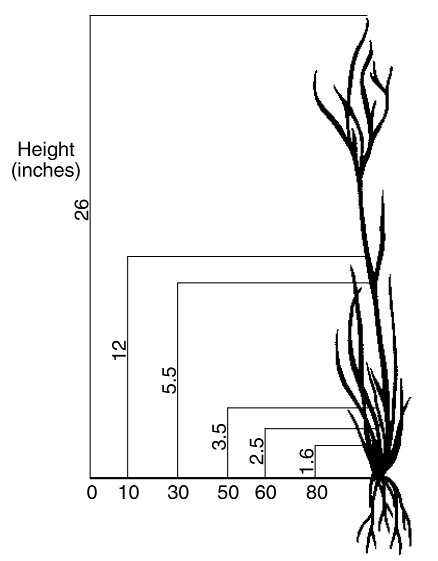 Figures 1, 2 and 3 show different grasses and the relationship between plant height and weight. Because most of the weight of a grass plant is near the base, 50 percent use by weight is not the same level as 50 percent use by height. 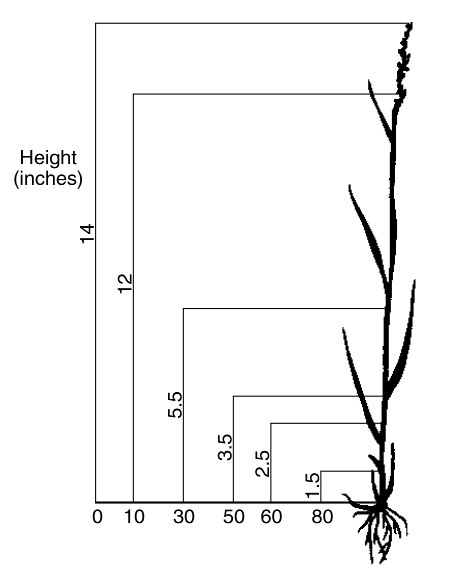 When measuring the height of key grass species, you must follow proper protocol (Figures 4, 5 and 6). 1. Place the stick upright, without it leaning. 2. 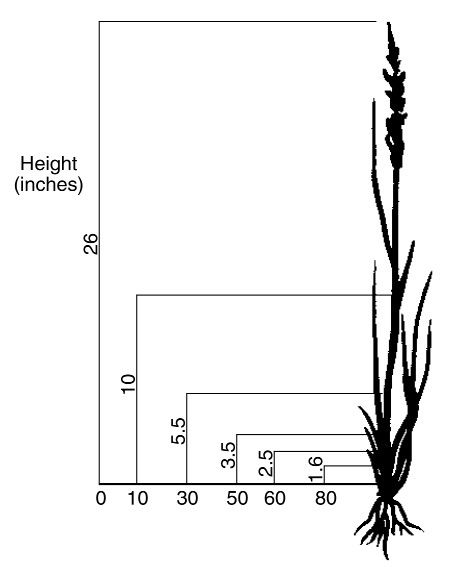 Measure the leaf height of the key grass species. 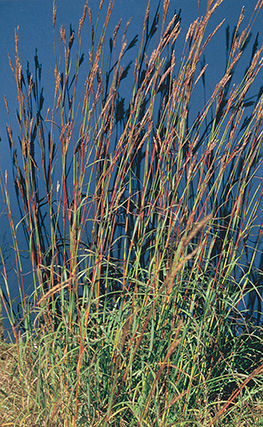 Choose a plant that is representative of other plants in the area. Be sure to evaluate the current year’s green leaf growth. If the leaf is bent over, use your finger to extend the leaf, using care not to pull (Figure 5). Do not measure to the top to the inflorescence. Identification of the key species in your pasture and rangeland is critical to implementing a successful grazing management plan. Because plant growth and recovery varies among species, knowledge of a plant’s season of growth and whether the plants are native or introduced is important. This portion of the GMS provides guideline on plant growth and recovery (Table 1). 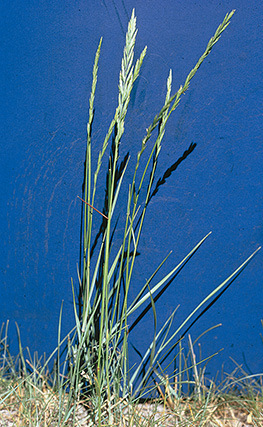 Introduced species initiate growth earlier in the spring than native species and can be grazed at the three-leaf stage in early May. However, native cool-season plants do not reach grazing readiness, the 3½-leaf stage, until mid- to late May or early June, and native warm-season plants do not reach grazing readiness until mid- to late June. In general, cool-season plants grow more rapidly from mid-May to mid-June, and warm-season grasses grow more rapidly from mid-June to late July. The decision to initiate grazing should be based on dominant species in the plant community and management goals. Giving plants sufficient recovery time following grazing is important. The greater the utilization of a plant, the more time it will need to recover. Precipitation and climatic conditions influence the time needed for a plant to recover. As a result, recovery rates vary from eastern to western North Dakota. Notice the difference of 15 to 20 days for rangeland and 10 days for pastureland between eastern and western North Dakota. 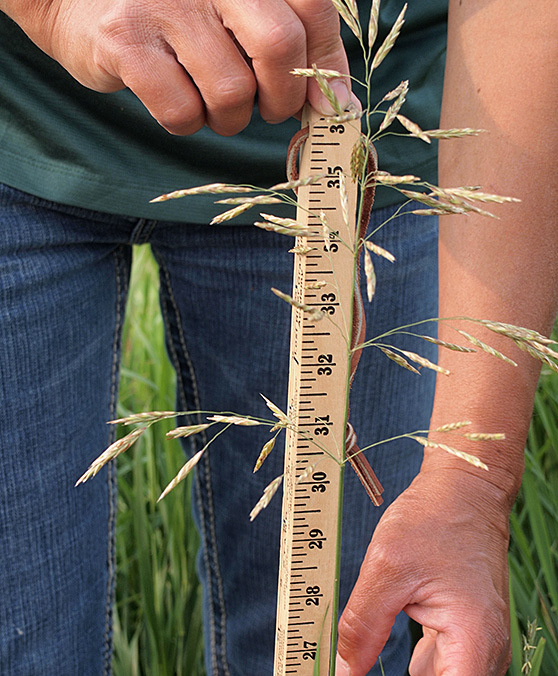 Leaf stage and height should be used to determine grazing readiness for pastures planted with introduced species. Grazing plants prior to grazing readiness can cause a reduction in herbage production, which can reduce the stocking rate and animal performance. A similar response occurs when plants are overgrazed and not given adequate time to replenish root reserves prior to the next grazing period. Table 2 recommends minimum heights to start and stop grazing on common pasture species. Avoid grazing the same native pasture at the same time every year. Provide enough recovery time before regrazing a pasture. Grass and legume mixes should be grazed in a manner that favors the dominant desired species. This section provides information on calculating utilization of key species based on height measurements of grazed and ungrazed plants (Table 3). To determine utilization, you must take measurements prior to pasture turn-out, during the grazing period and within three days of the removal of livestock. 1. Calculate the percent of the plant height removed by dividing the grazed height of the plant by the ungrazed height. Subtract this amount from 1. 2. Multiply this amount by 100 to determine the percent of height removed. 3. Correlate this number with those in the chart to estimate the percent of entire plant weight removed. [1 – (3 inches ÷ 12 inches)] x 100 = 75 percent of the plant has been removed. 2) Find the percent height removed on the top line of the chart and follow the column down to the appropriate species. The numbers in the chart are an estimate of the percent of the weight removed. Use the percent of height removed that you calculated and correlate it to the appropriate grass community classifications to find the percent in weight utilization of your grass. Each plant community has a number in bold in its row. This is the percent by weight utilization that is the minimum for proper regrowth. If you increase your utilization number, you are in danger of robbing that plant of its resources and may decrease production and sustainability of your ranch. Our example of 75 percent utilization by height (in italics) shows an estimate of the plant weight removal as indicated on the grazing stick. Note: For a western wheatgrass-dominated plant community, our example utilization of 75 percent indicates that we have removed 58 percent of the plant by weight and should remove livestock from the pasture. A general rule of thumb is to target 50 percent utilization by weight during a grazing period as well as at the end of the grazing season. If greater than 50 percent utilization occurs during a grazing period, plant recovery will be slower, requiring a longer recovery period between grazing events to maintain plant health. Over time, grazing beyond 50 percent removal of a plant community’s weight each year results in a diminished grass growth, resulting in reduced stocking rates and animal performance. If recommended utilization of key species is not being achieved or is being exceeded, we recommend that stocking rates be evaluated and adjusted accordingly. The stocking rate is the number of specific kinds and classes of animals grazing or utilizing a unit of land for a specific period of time. Stocking rate commonly is expressed as animal units per acre. If utilization goals are not being met, then one of these variables needs to be adjusted. Typically, the length of the grazing period or number of animals is adjusted. This section describes animal unit exchanges for stocking rates (Table 4). An animal unit month (AUM) is the forage needs of a 1,000-pound cow-calf pair for one month. An animal unit equivalent (AUE) is based on the type and weight of your livestock and their forage requirements in comparison with the standard AUM. To calculate the existing stocking rate of a pasture, use the formula in this section and input the AUE for the class of livestock from Table 4. To determine existing stocking rates in animal unit months per acre (AUMs/ac), use the formula below with the animal unit equivalent (AUE) chart. Adjust the AUMs/ac based on utilization and objectives. Producers and other land managers can gain important information from the visual appearance of a range or pasture. This section highlights an assessment tool used to visually estimate utilization on native rangeland (Table 5). This method can be utilized in combination with calculating utilization of key species in determining utilization of native rangeland pastures with diverse plant communities and multiple ecological sites. Consistent monitoring of pasture and rangeland is a key component of good range management. Monitoring utilization of range and pasture lands using the GMS provides a way to assess how much forage livestock and wildlife have consumed. The GMS can assist North Dakota livestock producers and other land managers in monitoring forage for long-term grass production and vitality. For more information on obtaining a GMS, please contact your local county Extension office. Utilization measures the percentage of annual herbage production that has been removed by weight. Utilization data, along with trend data, climatic information, actual use data and other information, should be used to adjust stocking rates to meet management objectives. Light to no use of forage. 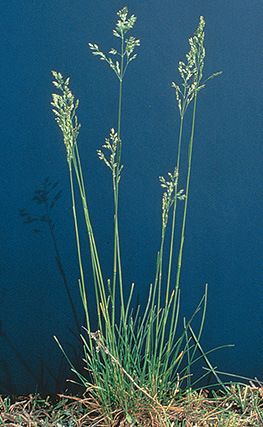 Height of herbaceous plants grazed at 65 percent or less. Rangeland appears entirely covered as uniformly as conditions allow. 65 to 80 percent of the height of the palatable herbaceous plants grazed. All rangeland shows use and major section closely cropped. Greater than 80 percent of height of key species grazed. Greater than 10 percent of low-value species utilized. Key forage species completely used. Low-value forages are dominant. This publication sponsored by North Dakota Grazing Lands Coalition. The NDSU Extension Service does not endorse commercial products or companies even though reference may be made to tradenames, trademarks or service names.